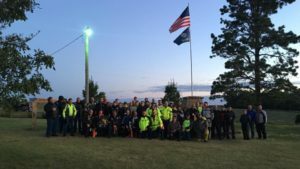 This year’s much larger crowd of riders showed where some minor improvements to the event can be made, and we’ll be tweaking the ride slightly next year in light of the great suggestions riders and local residents gave us. Additional Camping Available for 2017 Ride! The communities at the start and end of the ride are taking special steps to welcome Smackdab’ers to their towns! On June 13, 2017, the Lebanon, KS City Council agreed to allow Smackdab’ers to camp for free in their city park Friday night. There are restrooms, but no showers. The town of Lebanon is only about 2-1/2 miles from the start point, rather than the 16+ miles from Smith Center, so it’s a very convenient location. A big thanks to Lebanon for their hospitality! After the ride, the Rugby Chamber of Commerce are opening the Pierce County fairgrounds, just around the corner from the monument, for overnight tent camping on Saturday night. 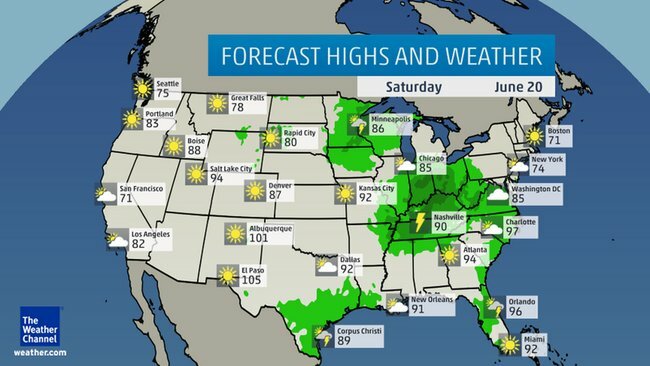 The grounds have free hot showers available for the Smackdab riders. This campground gets high reviews from the RV community. Thanks to Smackdab participant Michael Studer for initiating this request, and a big thank-you to the kind folks in Rugby. Due to an automatic software update, the online form disappeared from the registration page. It should be working again now. Sorry, and thanks for your patience! There are only a couple of days left to become eligible to get your finisher’s patch at half price ($5, rather than $10). Simply register online at smackdab281.org before the end of May. There is no cost or obligation to pre-register. If you’re not sure yet, pre-register anyway. You have the option of indicating how confident you are (or aren’t) of making the ride. Conversely, registering prior to the ride is not mandatory. It’s simply a way for us to gauge interest, have a way to contact prospective participants. The American Legion Riders in Smith Center have agreed to host a cookout dinner for Smackdab riders on Friday evening. Stay tuned for more details or call Stan Smith at 785.282.6644 for more info. 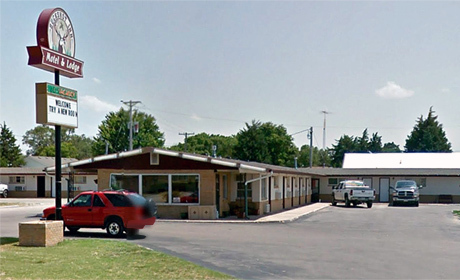 Stan Smith is the owner of the Buckshot Inn in Smith Center. He has asked to be our official departure motel. He’s a fellow rider and doing his best to promote the ride and responsible for arranging the cookout mentioned above, so please give him a call for your room Friday night. Call 785.282.6644 or visit www.buckshotinn.com. 15 Riders Complete Smackdab #1! 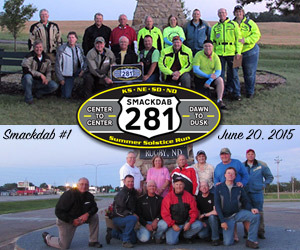 On June 20th, 2015, Fifteen riders (14 bikes plus one co-rider) completed the very first Smackdab ride. Riders rode individually or in groups of two or three, taking anywhere from 12 to 15 hours to complete the run; some riders were more serious about making good time, others took a more relaxed pace and stopped more often, but everyone arrived well before sundown. The oldest rider was 75 years old! The weather was perfect up until about 8:30 PM, when a brief shower drenched the last 20-30 miles of the route, punishing the last few riders for dawdling as they rode into town. A big thanks to Lebanon resident Kent Kennedy for showing up before 5:30 AM to see us off, and for Joseph Pelt, editor of the Pierce Country Tribune for being there at 10 PM to take our picture in Rugby. Only twelve riders are in the finisher’s photo because one rider headed further down the road before the 10PM dusk patch-and-picture ceremony, and 2 speedy riders had fallen asleep in their hotel room!